Here is the two part continuation of the interviews on the Real News Network between Paul Jay and Thomas Frank. Frank has the Clintons nailed, and continues to reiterate the high points of how they led the Democratic Party into an historic betrayal of their base, the working people. For money and power. However, he is far, far too kind, almost to the point of what can be called a willful bias, to Barack Obama. I am sorry, but can it be more obvious that Obama was a bait-and-switch brand for the oligarch class? He seems to come back to a more realistic assessment in the second segment. But he just cannot bring himself to draw the conclusion that Obama was not some hapless dupe, a victim of circumstance, but knew exactly what he was doing, and early on had made his choice of what or whom to serve. This post was published at Jesses Crossroads Cafe on 29 DECEMBER 2017. The Trump Administration quietly issued an Executive Order (EO) last Thursday which allows for the freezing of US-housed assets belonging to foreign individuals or entities deemed “serious human rights abusers,” along with government officials and executives of foreign corporations (current or former) found to have engaged in corruption – which includes the misappropriation of state assets, the expropriation of private assets for personal gain, and corruption related to government contracts or the extraction of natural resources. Furthermore, anyone in the United States who aids or participates in said corruption or human rights abuses by foreign parties is subject to frozen assets – along with any U. S. corporation who employs foreigners deemed to have engaged in corruption on behalf of the company. Of course, anyone who has been following the situation in Turkey over the past year-and-a-half (and certainly longer) knows that ‘suppressing terror’ is Erdogan’s popular euphemism for punishing or imprisoning suspected Gulenist sympathizers, and also anyone who dares to bring attention to Erdogan’s brazen corruption. As a result, the Turkish president has been busy lately, signing a flurry of decrees that have further consolidated political power in the office of the president – a stunning reversal from the early days of Erdogan’s political career, when he was a well-regarded moderate advocating much needed government reforms. I’m grinning like a Jack in the box clown today. I haven’t felt this good in a long time. I’ll be doggone if I will let anything change my mood. When you are done reading, I’m hoping you feel the same way. In 2016, I was bummed out. The negative political crap from the election left much of the country exhausted and frustrated. I was ready to turn the corner from the daily hysteria and melodrama in the media. In 2017 things just got worse, by December I was exhausted, mentally worn out! This post was published at The Burning Platform on December 23, 2017. Rumors that Saudi Crown Prince Mohammad bin Salman has hired mercenaries to torture recalcitrant royals and officials sleeping in the ballroom of the Ritz Carlton in Riyadh have been circulating since shortly after last month’s ‘corruption crackdown’ naked cash grab. Now, Middle East Eye reports that one of MbS’s guests has reportedly died under torture rather than fork over his money and assets to his domineering relative. He was reportedly beaten and tortured so bad his family members had difficulty recognizing his body. Major general Ali Alqahtani, who was detained in early November as part of an alleged anti-corruption drive, had been working in the royal guard forces. He was the manager of the private office of Prince Turki Bin Abdullah, the son of former king Abdullah Bin Abdulaziz, according to the newspaper. Alqahtani died on 12 December after being tortured with electric shocks, and his family struggled to recognise him after receiving his body, according to sources, the newspaper reported. This post was published at Zero Hedge on Dec 23, 2017. The Mexican peso has tumbled over 3% in the last 4 days, plunging to its weakest against the USDollar since March as the ongoing corruption investigation soured market sentiment. As we detailed yesterday, a deepening graft investigation involving Alejandro Gutierrez, a former deputy of sitting President Enrique Pena Nieto could imperil his party’s chances in the coming July elections. An ongoing scandal could also bolster the prospects of leftist rival Andres Manuel Lopez Obrador. This post was published at Zero Hedge on Dec 21, 2017. The news broke yesterday morning that Litecoin developer and outspoken founder, Charlie Lee, sold or donated all of his liquid Litecoin holdings. This prompted a big sell-off in the cryptocurrency markets, putting on pause the bounce off of the previous night’s bottom below $16000 for Bitcoin. This comes in the wake of Coinbase adding Bitcoin Cash (BCH) to its stable of coins available for purchase, which also sent shockwaves through the markets. And whenever I tweet about Litecoin price or even just good or bads news, I get accused of doing it for personal benefit. Some people even think I short LTC! So in a sense, it is conflict of interest for me to hold LTC and tweet about it because I have so much influence. I have always refrained from buying/selling LTC before or after my major tweets, but this is something only I know. And there will always be a doubt on whether any of my actions were to further my own personal wealth above the success of Litecoin and crypto-currency in general. The market reacted negatively to the news but only for a short time. Litecoin under Lee’s direction has been setting itself up as the day-to-day cryptocurrency. One that is easy to use, cheap, fast and easy to pay with. In an unprecedented decision with potentially serious consequences for Canadian Prime Minister Justin Trudeau, Canada’s outgoing ethics watchdog Mary Dawson has ruled that Trudeau violated conflict of interest rules when he took Aga Khan’s private helicopter to the business magnate’s private island in the Bahamas during a Christmas 2016 vacation. Trudeau is the first Canadian prime minister to ever be convicted of such a violation. According to the law, Trudeau needed to seek permission from the ethics watchdog before making such a trip – something he inexplicably failed to do. The ruling comes just weeks before the end of Dawson’s term, which is set to expire on Jan. 8. Last week, the International Energy Agency made a lot of OPEC brows furrow when it warned that 2018 may not be a very happy new year for the cartel. U. S. shale supply, the IEA said in its December Oil Market Report, is set to grow more than OPEC has estimated and this could be the undoing of the production cut that boosted prices this year. OPEC, for its part, has insisted that U. S. shale production won’t grow as much as the IEA says, baffling some observers who now wonder who they should believe. But let’s put it another way: If the coach of a football team tells you that his team will win the cup because they’re the best, but the football association has estimated that the team is not the best one in the league, who would you believe? Update 2: It’s all over, and the best case outcome is now fact, with Cyril Ramaphosa elected president of South Africa’s ruling African National Congress on Monday. CYRIL RAMAPHOSA ELECTED PRESIDENT OF SOUTH AFRICA’S ANC RAMAPHOSA GETS 2440 VOTES IN S. AFRICA’S ANC LEADERSHIP VOTE Ramaphosa victory threatens President Jacob Zuma’s grip on power after the most divisive vote in the party’s history. Ramaphosa, the deputy president, defeated Nkosazana Dlamini-Zuma, Zuma’s former wife, whom the president had backed. As the FT notes, it is widely speculated that Mr Zuma lent Ms Dlamini-Zuma his support because he believed that as state president she would protect him from prosecution in a corruption case. Meanwhile, Ramaphosa campaigned on a promise to root out corruption and save the ANC from losing its majority for the first time at the 2019 election. If you google ‘London moats’, you’ll probably alight on a link which will take you to ‘London’s Top 10 Moats: A Spotter’s Guide’. We had no idea there were so many and could only think of the ‘obvious’ one surrounding the Tower of London, even if it’s waterless these days. According to the guide, a defensive ditch has surrounded the Tower since its origins in the eleventh century. The moat, which contained water from the thirteenth century until the 1840s, helps to protect the roughly cuboid ‘White Tower’ keep, which gives the Tower of London its name. Built by William the Conqueror in 1078, the White Tower was resented as a symbol of oppression inflicted on London by the new ruling elite. Yesterday saw the press launch for the new US embassy in London which is situated on the south bank of the River Thames in the re-developed – albeit unattractively – part of the city near to Battersea Power Station. During the ‘celebrations’, architect James Timberlake, of Philadelphia-based firm Kieran Timberlake, described the new building as ‘the embodiment of peace and security’. The Daily Mailreported a spokesperson saying the glass structure ‘gives form to the core democratic values of transparency’. The lobby looks a bit ‘imperial’ to us, but we’re probably mistaken. Although she is cited as an investigative reporter, which she is, Nomiki Konst is also a political insider in the Democratic Party organization. And she is quite knowledgeable. This post was published at Jesses Crossroads Cafe on 14 DECEMBER 2017. ‘We believe cash-back incentives for using XtendiMax with VaporGrip Technology better enable growers to use a management system that represents the next level of weed control,’ said Ryan Rubischko, Monsanto product manager. 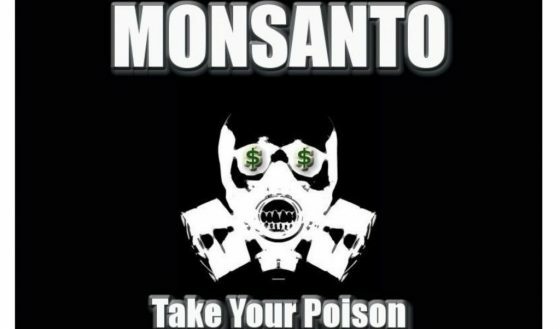 Monsanto faces bans and restrictions of its pesticides in several states due to damaged crops from its product which affected 3.1 million acres in nearly two dozen states, according to Reuters. XtendiMax costs about $11 per acre to buy, and Monsanto is offering an extra $6 per acre in cash back to farmers when they apply it on Xtend soybeans, rather than using another seed-and-chemical combination to control weeds. The rebate means farmers can receive up to $11.50 per acre in cash back next year when they use XtendiMax along with other approved chemicals, such as one called Intact that aims to prevent drift and costs $2.40 per acre, according to Monsanto. This post was published at The Daily Sheeple on DECEMBER 14, 2017. Freedom requires a sense of personal responsibility if it is to survive. With the nation’s news dominated by reports of political corruption (most recently, the Clintons’ apparent use of ‘pay to play’ schemes during Hillary Clinton’s tenure as U. S. secretary of state), sexual harassment scandals pandemic among the nation’s elites, extreme vulgarization of political speech and the common culture, riots against freedom of speech on the nation’s college campuses, paralyzing partisanship in Congress, death threats and open assassination attempts against government leaders and police officers, and the rest of the dismaying parade of moral shortcomings on display among the nation’s leaders in all walks of life, it appears that we are in the midst of a war not just between political and cultural factions, but over the very definition of our civilization.